Alice Klieg (Kristen Wiig) has borderline personality disorder and has recently stopped taking her medication. Despite the insistence of her psychiatrist Dr. Daryl Moffet (Time Robbins) and her best friend Gina Selway (Linda Cardellini), Alice refuses to go back on them, swearing she can regulate her emotions through a high protein diet. Alice sticks to her daily routine, which includes walking to the local corner market and buying a lottery ticket, but this time, she actually has the winning numbers and wins $87 million dollars. She uses her new-found millions to fulfill her dream of hosting a talk show like her idol, Oprah. She buys time at a local floundering TV station and produces her show called "Welcome to Me," where still off her meds, she continues her breakdown on live television. Kristen Wiig stars as Alice Klieg in this quirky dark comedy character sketch about a woman with a mental illness. Not only does Wiig play it with such a resounding conviction, but she is charming, funny, and delightfully weird, even though she is an emotional exhibitionist without a filter. Like most dark comedies, it finds humor in the tragic and walks a fine line between what might and might not be material that could be sensitive to some viewers. Though we know these types of films aren't for everyone, we have always really liked movies such as this, ones that can address tough issues through humor without making light of the situation. Kristen Wiig has become a regular in these independent, off-beat dramedies with past films like "Girl Most Likely" and "The Skeleton Twins," including the even the more mainstream "The Secret Life of Walter Mitty," which has a dark undertone to it. 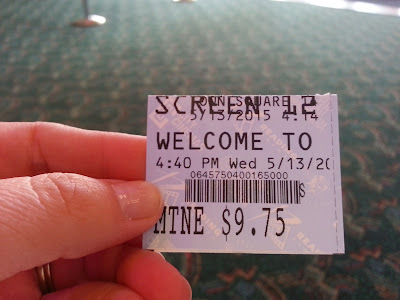 "Welcome to Me" offers up a lot of awkward humor where we felt uncomfortable and even cringed at times while watching what was happening on the screen, letting out several rounds of chuckles, hearty laughs and everything in between. Sometimes with movies like this, the only way to let out your discomfort is through nervous laughter to help ease the tension. 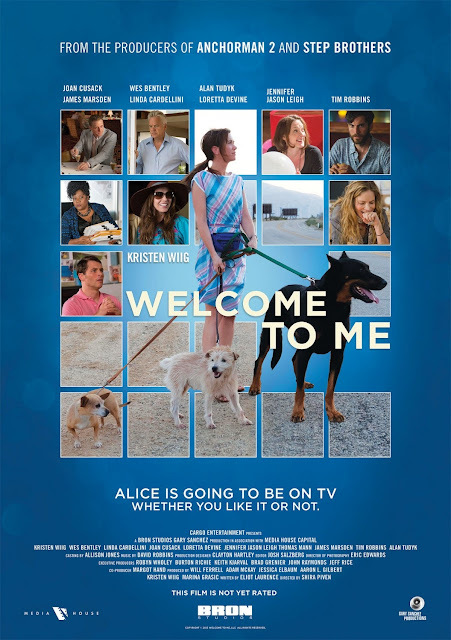 It is clear from the very minute she steps onto the screen that Alice has a lot of problems, but they don't just come from just her mental illness. She is also an extremely self-centered person, with or without any underlying issues, and is the worst kind of friend on a bad day. When she gets the idea to do her own talk show, she doesn't want to focus on specific topics or have guests, she just wants to talk about herself and what she's doing, as well lambaste the people from her past that did her wrong leading up to this point. This approach to her show is similar to our reality show and YouTube obsessed culture where the focus is all on the individual, not other, more important things. All YouTube vlogs and reality television are nowadays are loads and loads of minimally if at all talented, selfish and self-proclaimed gurus who get off showcasing their lives for the masses, whether perfectly pristine or horribly miserable, while occasionally pausing for an advertisement. It's really narcissism at its finest. Just like in real life, the crazier Alice acts, the more viewers and attention she attracts, not because she has any actual talent, but because it's an amazing trainwreck we can't help but get sucked into every now and then. We wonder what, if anything, this movie means to say about our current climate and culture, as beautiful and as ugly as it may be. Wiig is joined by a tremendous supporting cast. Linda Cardellini plays Alice's best friend Gina, who is almost the exact opposite of her in that she is much more giving and far more selfless, not to mention mentally stable. James Marsden plays Rich Ruskin, one of the owners of the TV station where Alice pitches her idea. Rich is smarmy and is willing to exploit Alice for her millions, despite knowing she is clearly mentally ill, and he does so under the justification of saving his employees. Without Alice's money, they would be forced to layoff a lot of workers. Wes Bentley plays Rich's brother Gabe, who is the other owner of the station, but is far more conflicted about taking Alice's money. He seems to have mental issues himself, primarily in that he becomes very attached to people and falls in love very quickly. He and Alice see eye to eye on a lot of things, and they bring out, well, a lot in each other. Joan Cusack plays station director Dawn Hurley, who offers up a lot of sarcastic commentary to Alice's bizarre on-air behavior. Cusack is known for this type of attitude and fits in well with the rest of the cast. Tim Robbins is the voice of reason in his role of Alice's psychiatrist Dr. Daryl Moffet, who comically condescends her want to replace her medication with string cheese. In a word, this cast is brilliant. Everyone involved plays off of each other very well to make this weird yet captivating movie. We are certainly glad we got to see it.